← Rotten to the core? 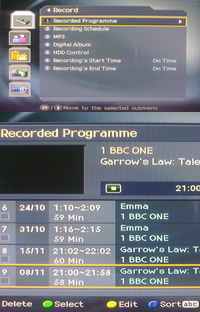 Last night I was sorting through the programs recorded on my Humax PVR. After you’ve negotiated an initial menu screen (surely getting a list of what you’ve recorded is such a common task that it deserves a button? ), it initially displays the list in reverse chronological order – so the latest programs are at the top of the list. You have to press the blue button twice to change the sort order to chronological (oldest first) and then alphabetical so that all the programs from the same series are displayed together. But guess what? When it sorts alphabetically, if the names are identical, then the order of those programs appears to be random. So, if you are catching up on the latest “Garrow’s Law” (as we were), would you want to watch them in a random order? No! Whoever designed the interface never tried to use it for one of the most common user tasks, did they? I’m working with a software company right now on a new professional product. We’ve been out talking to potential users, we’ve characterised those users in terms of what they do and what they use. Now we’ve written up a descriptive list of tasks that those customers are going to want to achieve with the product. We can test these tasks in the market with the users and we can test our designs, prototypes and the final product against them to ensure that they are achievable with ease and pleasure. It is that simple: understand what your users will want to achieve and then test against that. The little details of exactly how a product works can be the source of enormous frustration for users if they are poorly designed. If they are well designed they can make using the product a real pleasure as they zip through their tasks concentrating on outcomes rather than tripping over the rough edges of the UI. Many years ago when we were planning new releases of a software product we used to have a simple rule: “3 big things and 20 little things”. Each release needed 3 big new features that would help us grow our market and would attract PR attention. But that was not enough. We would also include 20 small changes that would benefit our users, sometimes really small things like moving a button, or making one thing happen automatically after another. It was these little changes that gave us a loyal following amongst our users, because with each one we demonstrated our understanding of what they needed to do, and we made their lives just a little bit easier. So, come on Humax, demonstrate to us, your paying customers, that you use your own products and are passionate about delivering a high quality user experience. This entry was posted in create and tagged design, development, product, product definition, specification. Bookmark the permalink. That’s ironic because Humax makes TiVos under license, and TiVo has the best user interface of any PVR made. Hi Paul, I did not know that. Of course we’ve been denied the pleasure of using TiVo over here in the UK. Sky bought the rights and buried it very deep so that it could bring out its own PVR and keep control of their viewers. Now that the rights have reverted to TiVo, Virgin have struck a deal with them and we’ll get a Virgin TiVo over here in 2010.